Incoming, known as Incoming: Jinrui Saisyuu Kessen (インカミング 人類最終決戦) in Japan, is a Sega Dreamcast game developed by Rage Software. 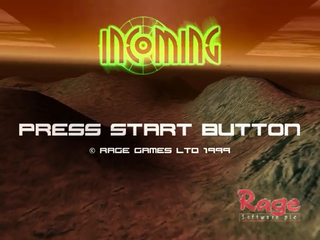 Incoming was originally a PC game, released in March 1998 to much fanfare from the gaming press, however this Dreamcast port garnered a more lukewarm reception. A PC sequel would be released in 2002 as Incoming Forces.